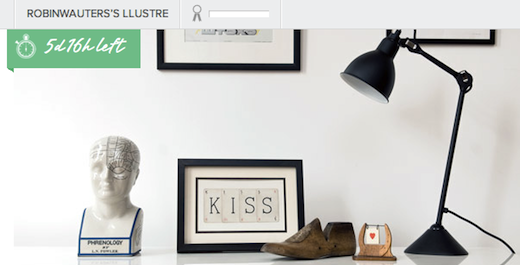 Fab, the fast-growing online design sales site, has acquired fellow design store LLUSTRE.COM, which will be henceforth be known as Fab UK. The news was due to be announced by Fab later today, but looks like LLUSTRE.com jumped the gun on its own blog. The UK launches comes as social shopping phenomenon Fab celebrates its first birthday, and brings the total of countries in which it is available to 20 (after having recently rolled out across Europe). Fab says it now boasts 5 million members, and is announcing today that it is now working with over 5,000 designers and sold 1.8 million products in the past year. The acquisition of LLUSTRE.COM is Fab’s third purchase after previously buying Germany’s Casacanda and Fashionstake in the United States. LLUSTRE has been a great success because every member of the team is passionate about what we do. In seven short months, we’ve gone from a team of two to twenty-four, and since we launched the site ten weeks ago our membership has grown ten-fold to over 50,000. We’ve already worked with 160 of our favourite designers from 19 countries, and sold more than 2,500 of their fantastic products to people across 9 countries worldwide. It’s worth noting that LLUSTRE.COM was launched as recently as April 2012 (but founded in November 2011). The company is today relaunching as Fab UK, where UK-based visitors to Fab.com will also be henceforth redirected to. The company now boasts more than 1 million members in Europe alone, and to underscore how important the continent is for Fab’s business, the startup has promoted Maria Molland to the expanded role of Chief European Officer. She previously ran global businesses and new ventures for Thomson Reuters. Fab launched in Germany in February and rolled out in additional European countries gradually afterwards, and the company says already 25 percent of its European sales are from outside Germany. In total, Fab says it projects Europe to contribute about 20 percent of its total sales this year.